Welcome to The Conscious Cat 2018 Holiday Gift Guide – your one stop shopping solution for all the cats and cat lovers on your holiday gift list! This year’s guide features only the best products for cats and cat lovers on the market. And even better: many of the companies featured are offering exclusive discounts to Conscious Cat readers! Have bed will travel. The multi-functional Sleepypod Air helps to mitigate fear and anxiety when traveling because Ultra Plush bedding encourages use as a cozy napping spot to aid in acclimation to this soft-sided carrier. When ready to travel, your kitty will feel at ease in a familiar space. At the travel destination, Sleepypod Air is a comfortable and familiar bed away from home. This innovative carrier can be used for in-cabin air travel and as a crash-tested car seat. For added versatility, Sleepypod Air folds flat for easy storage, has a trolley pocket to attach to telescopic luggage handles, and pockets to stow necessary travel items. An optional Warmer Kit helps to soothe pets with warmth at home and on the road. Sleepypod Air is a Fear Free Preferred Product. Available in seven colors. The Sleepypod Go Bag is built for pet travel, but clever enough for human travel. Easily organize pet essentials (and yours) with this go anywhere bag that’s practical yet stylish. A tapered profile makes it comfortable for cross-body carrying, while the streamlined grab handle amplifies on-the-go convenience. Travel is made easier by two mini packing cubes and an insulated food pouch. Thoughtful features include gusseted side pockets, a structured design and flat base for stability, exterior utility ring for hanging a leash/flashlight, interior lanyard for keys, and a large padded pocket for separating documents or cradling a tablet/computer. Available in four colors. Give the gift of a DIY Catio Plan for your cat or the cat lover in your life! Gift Certificates are available for $49.95 and the recipient can choose from four catio designs for a window, deck, patio or yard. Catio Spaces’ award-winning DIY Plans take the guesswork out of building a catio. Each plan includes a materials list, tool list, step-by-step instructions and diagrams for a successful project. Keep your cat safe, healthy and happy while enjoying the enrichment of the outdoors. Catio Spaces’ DIY Catio Plans were chosen as one of the 10 Best Cat Products of 2017 by The Conscious Cat. Life is good in a catio! Catio Spaces will donate 10% of each gift certificate purchased by Conscious Cat readers to an animal welfare organization. Enter code CC18 at checkout. Offer expires December 31, 2018. The Primetime Petz Lounge is available from Amazon. These fun Wiggly Ball toys from Dezi & Roo mimic live prey thanks to fuzzy tails that wiggle and curl and balls that bounce, rattle and roll, providing your cat with a simple but highly addictive playtime toy. Cats LOVE to play with them and owners LOVE how they help keep their furry friends active, engaged and entertained. Purrfect for cats of all ages! The Hauspanther MaxScratch from Primetime Petz offers cats and kittens a sizeable scratching post for climbing, clawing and perching. This oversized cat scratcher is wrapped with natural jute rope, creating a durable and attractive scratching surface. A sturdy base keeps the post from tipping over and the built-in perch on top gives kitty the perfect lookout spot. BONUS FEATURE: The scratching column can be flipped over for extended use! Simply remove the top and the base, flip the column over and reassemble. If your cat scratches in just one place on the column, no problem! Simply flip it over and let kitty keep scratching! We all know that cats love to sit in sinks, so the Hauspanther NestEgg and TriPod Cat Lounges by Primtime Petz were designed to create the same feeling. A clear plastic lounge pod makes the perfect place for kitty to curl up and metal hairpin legs give both lounges a sleek mid-century modern look. The NestEgg also doubles as a side table! The plastic pod can accommodate a variety of other uses including toy storage, cat grass planter, beverage server, ice bucket, or candy dish. This is the softest cat bed I’ve ever seen. Allegra and Ruby absolutely adore this bed (which is why I had to get a second one!) . The super soft surface and the overstuffed bolster are made from fluffy, flush cotton that is so soft to the touch, I just wanted to lie down and curl up in it myself. Did I mention this bed is really, really soft? The bed has a non-skid bottom so it won’t slide around on tile or hardwood floors. The entire bed is machine washable. The Jackson Galaxy Donut Cat Bed is available from Petmate. Exclusive 20% discount for Conscious Cat readers: Use code HAPPYCAT at checkout. Discount never expires and is good on all Petmate products. These adorable cat baskets are custom made for cats of all shapes and sizes, so no two will ever be alike. They are made from an assortment of t-shirt and fabric yarns. The result is a basket cats can dig their nails into and make biscuits and the best part? No shredding left behind! The baskets measure 19 inches long, 6 inches tall and 6 inches wide, when flattened by kitty, they measure 15 x 16 inches. The baskets are washable and are available in a huge variety of primary and secondary colors. Generously sized at 60 inches high, this multi-level cat tree is made from wood and features carpeted platforms. What I absolutely love about it is the versatility it offers. Not only does it blend easily with any decorating style, but the fact that it’s easily movable makes this an awesome catification item. For cats who either don’t respond to catnip, or cats who would like an alternative to catnip, Space Kitty Express offers adorable toys filled with lemongrass, honeysuckle, silver vine, and valerian root, including this generously sized Leopard Kick Stick with Tassles. Exclusive 10% discount for Conscious Cat readers: use code CONSCIOUSCAT at checkout. Discount never expires. Spoil your kitties this holiday season with Catit’s range of quality cat products, designed with your cat’s wellbeing in mind. From stylish cat furniture perfect for hiding, snoozing and scratching, to toys that stimulate your feline’s senses, they have it all. For more information and to purchase, visit Catit.com. 20% discount on all products, no code required. Triple T Studios’ designs are inspired by cats for stylish women who embrace Feline Finesse® and shun the “Crazy Cat Lady” stigma. New this season: Cat Snap Cardigan, Gloves, Black Gold Jewelry. Triple T Studios supports global big cat conservation including Lion Guardians, Cheetah Conservation Fund, Wildcat Haven, Panthera’s Tigers Forever. Exclusive 20% discount for Conscious Cat readers: use code ConsciousCat20. Code never expires. Custom portraits are a wonderful way to celebrate a special cat, or preserve the memory of a cat no longer with us. Jessica Lindell’s water color portraits capture emotion and personality in vibrant colors. Allow approximately four weeks for delivery from the time you order. Exclusive 10% discount for Conscious Cat readers: use code CATLOVE10 at checkout. Code never expires. Like the popular blog and book of the same name, the Texts from Mittens 2019 Day-to-Day Calendar illustrates the kind of conversations humans and cats would have if cats had smart phones and could text us what they were thinking. The full-color pages feature imaginary, humorous, yet candid conversations between “Mitty,” a self-absorbed, dog-hating, overanxious housecat, and his beloved owner. The 2019 Texts from Mittens calendar is available from Amazon. Are you a member of Team Cat Mojo? Show your love for cats and for Jackson Galaxy with a selection of whimsical and practical merchandise ranging from coasters to mugs to phone cases to apparel. It’s back by popular demand: The 2019 Conscious Cat Wall Calendar is now available for purchase! Allegra and Ruby spent hours picking out just the right photos, and they made sure that they received equal representation. To my knowledge, this is still the only calendar on the market that exclusively features tortoiseshell cats. Click here for more information and to purchase. The Microchip Pet Feeder is ideal for multi-pet households to prevent greedy pets from becoming overweight and to that the right food is consumed by the right pet. The SureFeed Microchip Pet Feeder only opens for a registered pet’s veterinary implanted microchip or RFID collar tag to prevent pets stealing each others’ food. The lid of the feeder not only stops pet’s stealing food, but when closed the sealed bowl keeps food fresher for longer. Exclusive 20% discount code for Conscious Cat readers: Use code ConsciousCat20. Discount valid through January 31, 2019. The Microchip Pet Door Connect lets you to stay connected to your pet from anywhere. Combined with the SureFlap Hub (required – sold separately) and Sure Pet care app you can lock the door remotely, receive notifications on your pet’s movements and monitor changes in their activity over time. The Pet Door Connect is suitable for cats and small dogs and uses your pet’s existing microchip as an electronic door key, keeping out unwanted intruder animals. The Sure Pet care app lets you know when your pet enters or leaves the house and sends a notification when an intruder has tried to get in. Cat people know! You can find the NVR Miss Litterbox™ on duty at cat rescues and shelters, cat boarding facilities, cat breeder and exhibitor kennels, veterinarian clinics., and in homes around the world. Cat experts prefer that their cats use the NVR Miss Litterbox™. It has proven itself to be the best solution for vexing litter box issues and a great value. LivePeeFree® products are safe for pets, kids, adults and the environment because they use no harmful chemicals, enzymes, fragrances, encapsulators or surfactants. The are 5x more effective than other products, so the odor won’t come back! Spray Live Pee Free®! 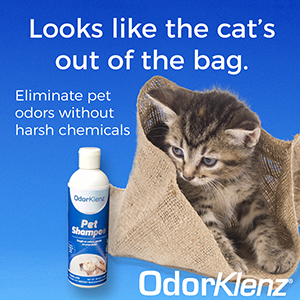 On any surface to remove urine odors and spray it lightly above your litter box to control odors. Love the folding cat tree! It looks like a book shelf! I always struggle with pet furniture because it doesn’t blend well into human furniture, but this one is an exception for sure. These are all some wonderful items. We like the microchip feeder and the microchip pet door. Great to have to see what’s going on when you are not home. Thanks for the share. Have a wonderful day. We just found a kitten this weekend and our resident cat has special food. I’ve been eyeing the SureFeed microchip feeders, thanks for posting a discount code! Those are some nice things. Any of them would make a wonderful gift. Thanks for the lists! I see a few products that I could use.